Situated on a sloping site in south Dublin, the front garden was terraced and divided into a number of ’garden rooms’, providing different points of interest throughout the day. 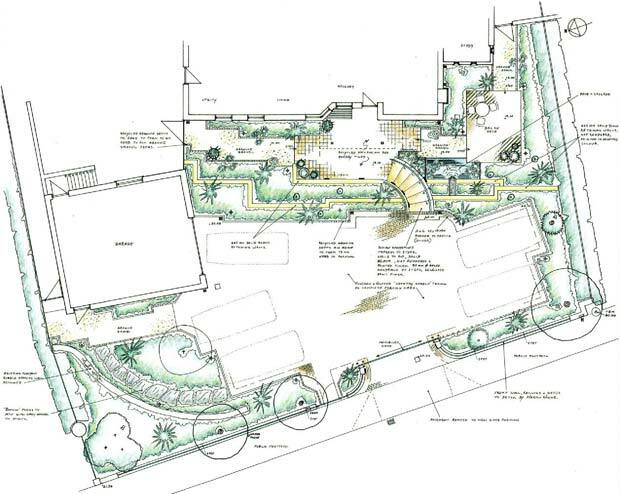 Large Dublin garden design drawing which works with a sloping site. The garden design included granite walls, railings, remote controlled entrance gates and curved sandstone steps down to main entrance. 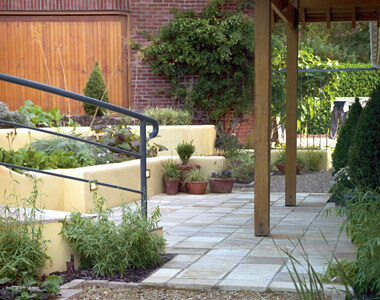 Stepped retaining walls finished in a soft yellow were used to break up and ease the level change from the car parking area down to the house. 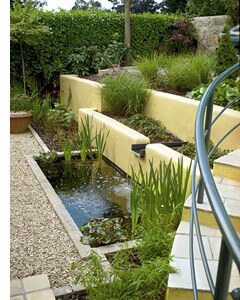 Curved steps, a formal water feature and stepped planting lead from the raised parking area to the front door. With the redesign of the rear garden, the client brief led to the creation of a circular patio with a large, wrap-around water feature leading to a sweeping lawn, bordered by broad swathes of perennial planting and ornamental grasses. Large contemporary water feature with bridges wraps around the patio entertaining space, which also features bespoke garden furniture. 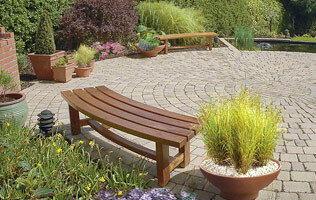 Bespoke hardwood benches and a built in barbecue were designed to match the radius of the patio curve. 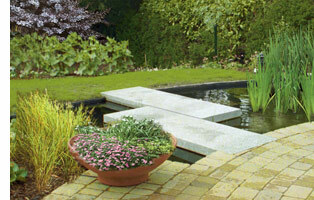 The water feature was bridged using staggered granite slabs as access to the main lawn, with a focal point gazebo set into the planting at the bottom of the garden.